The College of Nursing and Health Care Professions hosted an open house on Aug. 23. 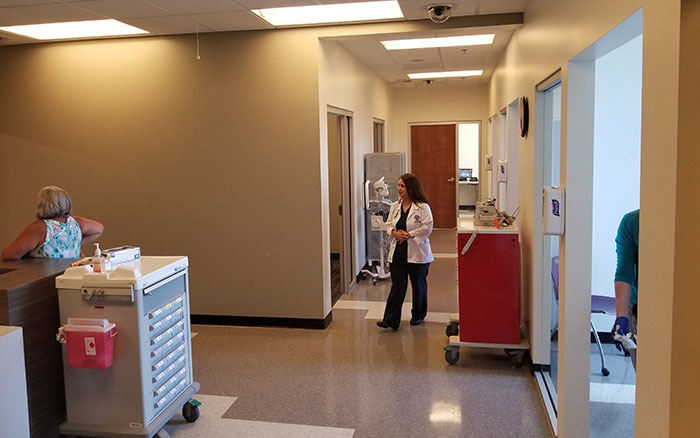 There was a lot of work to be done this summer when the College of Nursing and Health Care Professions at Grand Canyon University switched buildings with the College of Theology. But thanks to diligent planning, moving boxes wasn’t the only task accomplished. CONHCP has been planning major facility upgrades for years. And on Thursday, faculty and staff hosted an open house to showcase what has come to fruition in the Natural Sciences Building. 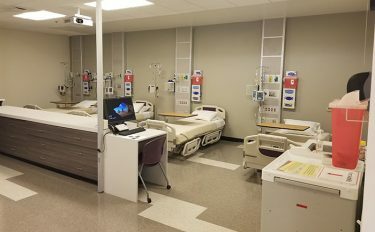 The second floor is now home to a new simulation lab with nine clinic–style rooms for use by the college’s family nurse practitioner students, while the third floor now holds a second immersive simulation lab, which will be shared with both pre-licensure and acute-care nurse practitioner students. “We are just really excited to be able to implement this and our hopes are also to then incorporate the standardized-patient model, which will come in months down the road,” Wisely said. Wisely explained that the standardized-patient model is used at many universities with medical and physician assistant programs, putting GCU on par with those offerings. The model trains professionals who are already in the field to come into classes and be a part of the lesson. “Many facilities will use actors and they will train them to accommodate themselves to those case scenarios for the students to have an even higher level of learning,” Wisely said. Nurse practitioner instructor Cathy Smyser, full of energy at the open house, said the facilities are a dream come true. The third floor of the Natural Sciences Building is home to a skills lab. Up on the third floor, the pre-licensure and acute-care nurse practitioner students have quite the setup themselves. The first immersive sim lab opened in spring 2018, featuring the latest technology in clinical simulation, including manikins (the medical spelling for mannequins) that have a pulse, blood pressure, a reactive chest and the ability to blink, cry and even give birth. Newly installed software and equipment will allow simulation activity to be recorded and analyzed to determine if there are any gaps in student knowledge. This allows for real-time feedback to students and allows faculty to analyze and trend the data. But across the hall, students in the fall also will have an additional skills lab to practice what they learn in the classroom. Pre-licensure students who use the third-floor facilities will go on to take the National Council Licensure Examination (NCLEX) following their studies – a test the GCU students have recently been passing with flying colors. The college posted an NCLEX first-time pass rate of 95.65 percent in the second quarter of 2018, bringing GCU’s year-to-date rate to 92.86 percent — exceeding the year-to-date statewide average of 91.89. The CONHCP dean, Dr. Lisa Smith, attributed the stellar test scores to the college’s great team of faculty and staff and to students’ increased exposure to lab and simulation.